Will GOP Governors Really Try "Nullifying" Obamacare? Despite Americans overwhelmingly rejecting Mitt Romney and his plans to "repeal Obamacare on day one," an effort to nonetheless thwart the federal health care law on the state level is underway, led by the Koch-funded Americans for Prosperity and Cato Institute, with help from American Legislative Exchange Council (ALEC) model legislation. Wisconsin Governor Scott Walker is a key holdout and has not indicated whether he will continue to actively block the health care law. After a majority of Americans reelected President Obama on November 6, ensuring that his signature health care reform remains what even House Speaker John Boehner acknowledged is "the law of the land," several Republican governors -- Rick Scott (FL), Bobby Jindal (LA), Sam Brownback (KS), Rick Perry (TX), Nikki Haley (SC), Nathan Deal (GA) and Robert McDonnell (VA) -- announced they would nonetheless refuse to implement the state-based health care marketplace "exchanges" that are key to reducing health care costs and expanding access. In Missouri, voters approved a ballot measure on election night giving the decision about creating the state's exchange to the Republican-led legislature, eliminating the chance that Democratic Gov. Jay Nixon might authorize the state's exchange. Under the health care law, states that do not design their own plan will have the federal government do it for them. The David Koch founded-and-funded Tea Party group Americans for Prosperity (AFP) quickly issued a press release "applaud[ing] the principled stance of these governors," and is now circulating a petition to residents of other GOP-led states urging governors to reject the exchanges. 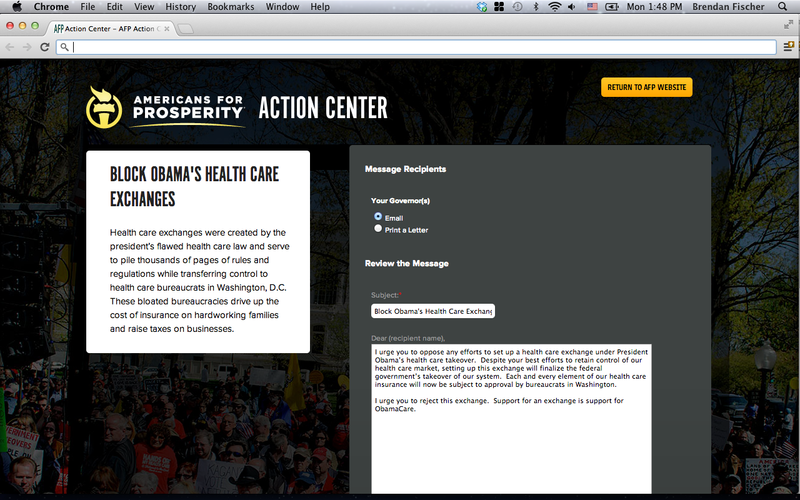 The Tea Party group Freedomworks is also circulating a petition. 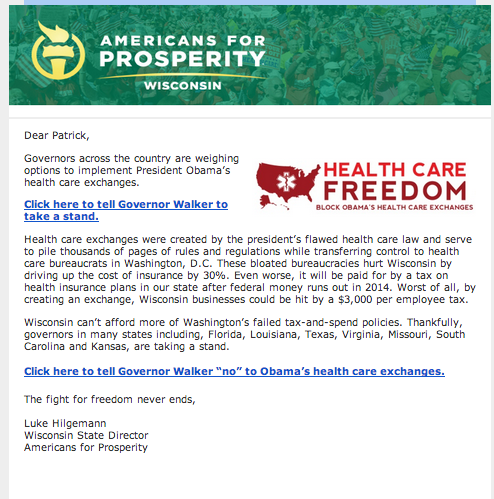 A key target for AFP and Freedomworks is Wisconsin Governor Scott Walker. Walker initially began setting up the exchanges in 2011 -- albeit with a decidedly right-wing bent, titling it the "Office of Free Market Health Care" -- then returned $38 million in federal funding and said, "We're going to wait. We said all along there was a legal step, there's a political step and after each of those steps were exhausted we see what the future holds." Now that each of those steps are exhausted, Walker must meet a Friday, November 16 Health & Human Services deadline to declare whether he will move forward with an exchange or follow the lead of other Tea Party governors and default to a federal government-led plan. Why are Republican-led states, typically averse to federal intervention, giving up the opportunity to design their own exchanges? A handful of right-wing legal theories and tactics have been floated to make right-wing activists believe they can successfully battle health care reform on the state level. A leading theory comes from the Koch-founded Cato Institute, which has asserted that the entire health care law cannot take effect if a state defaults to a federal exchange. The online insurance marketplace exchanges are not only where individuals can shop and compare insurance coverage, but also where low-income individuals can qualify for "premium assistance" tax credits from the federal government to offset the costs. Cato's Michael Cannon and Case Western Reserve University School of Law Professor Jonathan Adler have argued the health care law was drafted in such a way that the tax credits are only available through a state-run exchange, but not a federally run exchange -- and without those subsidies, the law would collapse, since many low-income people could not afford coverage. Additionally, Cannon and Adler argue, because the tax credits trigger the "employer mandate" requiring all companies that employ more than 59 workers to provide insurance, defaulting to a federally run exchange means businesses would not be subject to tax penalties if they fail to purchase coverage for their workers. The Cannon and Adler position is at odds with that of the IRS, which has interpreted the law to provide tax credits regardless of whether an exchange is run by the states or the federal government. The State of Oklahoma is relying on Cannon and Adler's theory in a lawsuit challenging those IRS rules and arguing the tax credits are only available for state-run exchanges. Oklahoma's suit has been described as a way for states to "protect job creators from being subject to large and variable penalties." If Oklahoma were to prevail in its suit -- a prospect many scholars believe is unlikely -- the individual mandate could still be in place, but the subsidies for low-income residents would disappear, leaving many individuals in a precarious situation. 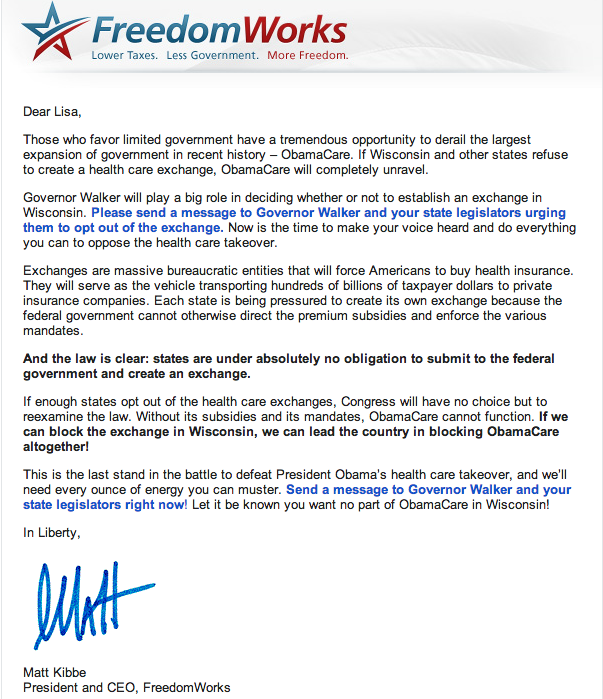 In Wisconsin, Cannon has appeared on right-wing talker Vicki McKenna's show, and his writings have been circulating among Tea Party groups advocating for Walker to reject the exchanges. The "corporate bill mill" ALEC has also been pushing an initiative to thwart federal health care reform at the state level. In 2011 and 2012, 43 states introduced laws or constitutional amendments modeled after the ALEC "Freedom of Choice in Health Care Act" that would thwart the law's individual mandate by prohibiting state residents from being required to purchase health insurance. The laws passed as a constitutional amendment in seven states (three as ballot measures on November 6) and as statutory provisions in thirteen. According to ALEC, the Freedom of Choice in Health Care Acts set the stage for Tenth Amendment litigation by creating state laws at odds with the federal healthcare reform's individual mandate. ALEC's law could work in tandem with the Cannon-Adler notion that Obamacare cannot be fully implemented through federally run exchanges. If both efforts were to pass legal muster, the Freedom of Choice in Health Care Act could theoretically block the individual mandate in a state, and the Cannon-Adler theory would block the employer mandate. ALEC hosted a conference call in August with Cannon and Adler to explain their theory to members of the Tax & Fiscal Policy Task Force. There could be further problems within states that have passed the law but whose governors nonetheless set up the exchanges. In Ohio, for example, a Health Care Freedom Act was added to the state constitution, and some have asserted that if Governor John Kasich sets up an exchange he will be violating the state constitution by indirectly compelling a person to participate in a health care system. ALEC has lobbied Wisconsin legislators on the ALEC Freedom of Choice in Healthcare Act, and a version of the bill was introduced and passed the Wisconsin Senate but failed to pass in the House. With the Freedom of Choice in Health Care Act, ALEC is essentially arguing for "nullification," a legal theory that relies on the notion that any state has the right to nullify or invalidate a federal law the state deems unconstitutional. ** The U.S. Supreme Court has rejected nullification, most recently in the 1950s when Southern states tried using the strategy to resist racial integration of public schools. (The Cannon and Adler theory is based largely on a textual analysis of the health care law and is not "nullification" in a traditional sense). But even in states where the ALEC Freedom of Choice in Health Care Act has not become law, Tea Party groups and others on the right have been urging governors and legislatures to find other ways to "nullify" health care reform. The day after the U.S. Supreme Court upheld Obamacare as constitutional, Americans for Prosperity-Wisconsin held a rally with Michael Boldin of the California-based Tenth Amendment Center arguing directly for nullification, telling the crowd that "any act or set of actions that you take on a state or a local level which has as its effect rendering a federal act null and void -- that's what we are trying to do." In July on the Rush Limbaugh Show, George Mason University economics professor Walter E. Williams argued that, "I think the American citizens ought to press their state governors and legislatures just to nullify the law -- just to plain nullify it and say, 'The citizens of such-and-such-a state don't have to obey Obamacare because it's unconstitutional, regardless of what the Supreme Court says.'" Legal scholars expect that efforts to nullify the federal health care law would fail because, under the U.S. Constitution's Supremacy Clause (Article VI), the federal law would trump any "Health Care Freedom Acts" or state executive orders. "Walker has tried to build up his political credibility with the national GOP and Tea Party by being a leading opponent of the health care law," says Robert Kraig, director of Citizen Action Wisconsin, who notes that Walker is the head of the Health Care Committee of the National Governors Association and has been a "ringleader" for right-wing governors on the issue. 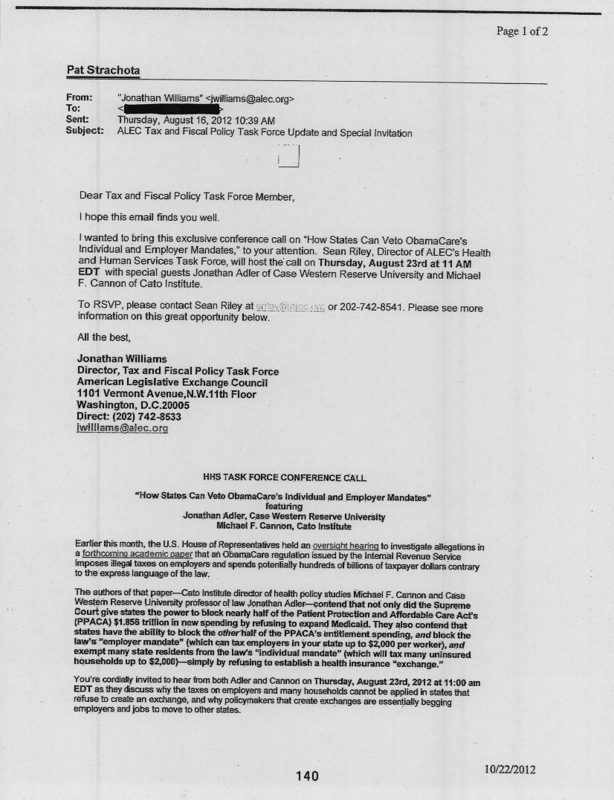 But, Kraig says, key groups important to Walker such as "the insurance industry groups and the National Federation of Independent Business are lining up in favor of establishing a state exchange" rather than letting it default to the federal government. With Walker stuck between Tea Party group opposed to the exchanges and industry groups in support, Kraig says the governor may try "playing it both ways:" setting up an exchange that does not meet the basic consumer protections required under the federal law, such as minimum coverage or cost-sharing requirements, and then "cast the federal government as the enemy" if it takes an enforcement action against the state and its sub-standard exchange. This could satisfy his industry supporters while still appealing to his national right-wing audience. 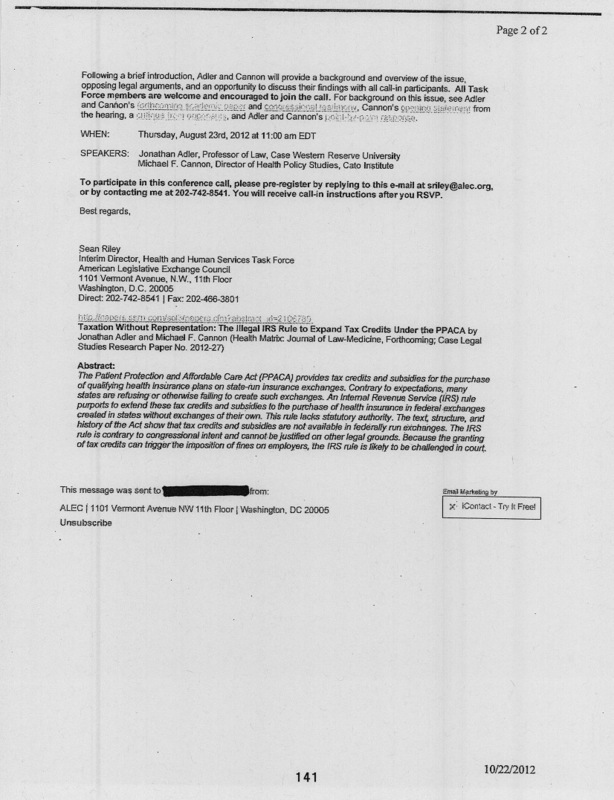 Information obtained through open records requests indicates the state does have a blueprint for a plan if they decided to go that route, Kraig notes, albeit one developed in secret and without shareholder input. Regardless of what path Walker takes on the exchanges, once the legislature is back in session he is going to have to contend with the Republican-led legislature. At least nine Republican lawmakers say they back legislation to arrest any federal official who tries to implement the health care law in Wisconsin. * The "Wisconsin United for Nullification" Facebook page was initially attributed to the Tenth Amendment Center, since the organization's web address is listed on the page. The Tenth Amendment Center has contacted us to say they are not responsible for the Facebook page. We regret the error. ** The article initially stated nullification was "a legal theory asserted before the Civil War to protect slavery in the South (although Northern states also tried using it to reject the Fugitive Slave Acts)," but as some readers noted in the comments section (read below), nullification was discussed before the Civil War to protect slavery, but never "asserted" because there was no federal law outlawing slavery. The reference has been deleted because it distracted from the main point of the article. Though some activists have asserted the doctrne in America's history, it has been repeatedly rejected by the U.S. Supreme Court. I believe the majority of the people spoke in this election by re-electing the president. Stop fighting him please. I will continue to buck. Even if your belief that 50% is a majority were true, I will fight. I will resist. Even if resistance is futile, I will not join hands across your black America. Let blacks have their leader, we will seek others. You have not seen anything yet. Enjoy your win. Black America? Seriously? I suppose expecting people to evolve past a Reconstruction mindset is too much when they probably don't believe in Evolution anyway. It's sort of sad to think of you spending your life this way, Jeff chasing around in the eddies in your head. I feel sorry for you. People of every race are all the same, we're all human beings, we're all the same inside. Your remarks are so totally rascist it's unbelievable. Obama is all of ours president and whether you want to disagree he is a good president. Just because your party tells you to be that way, you do it? Do you do everything they say? They are wrong, their ideas are not what this country is about, their radical ideas have their base so riled up and for what? You have been lied to and manipulated from the party that used to be ok and now is infiltrated by these radicals. Are you in some dream world that you think you're back in the beginning of this country and playing the part of the bad guy? Your beliefs are what this country fought to get rid of. Your comment only adds fuel to the notion that the divisions in our nation follow most closely along the lines of race. You obviously believe in white supremacy, a notion that seems to be quietly shared by more conservatives than would directly admit it. While I, personally, don't subscribe to either political party's dogma, I find the notion of white supremacy to be arrogant and societally despicable in its attempted enforcement, i.e. human slavery, Nazism, etc.. The Confederacy was an attempt to preserve the southern aristocracy in spite of the intent of the American Revolution that established the republic in the first place. The Old Dominion lost in 1865. The Nazis lost in 1945. Whites have no special right to rule the country or the planet. I'd suggest you get in very close touch with that reality before you spew more vitriol at those who are simply trying to find a way forward for all humans on the planet that refuses to prefer one group over another. Millions of us will stand in opposition to the Federal Government. Now you might not like that, but deal with it. The Federal Government is a deadly enemy of the Constitution. The States can tell the Feds to take a hike, and if the Governors have any moral fiber it will be done. I agree with you An. I'd like to point out some factual errors with regards to nullification and slavery. Visit this site of secession documents and search for 'null'. http://sunsite.utk.edu/civil-war/reasons.html You will find that Mississipi, South Carolina and Texas all explicitly stated that nullification of the fugitive slave laws was a primary impetus for secession. They name the states using nullification to protect human rights: Maine, Vermont, New Hampshire, Connecticut, Rhode Island, Massachusetts, New York, Pennsylvania, Ohio, Wisconsin, Michigan and Iowa. So, the assertion that nullification was used to protect slavery is false, nullification was actually used to protect the slaves. Slavery was effectively abolished in the non-slaveholding states via nullification, prior to any change in federal law or the Constitution. The next error has to do with the first uses of nullification. Nullification was first used to reject the Alien and Sedition acts which were clear violations of the First Amendment and free speech. This was in 1798, where the terms 'nullification' and 'interposition' were used by Jefferson and Madison in the Kentucky and Virginia resolutions. I noticed that you neglected to mention the most recent and potent uses of nullification. The states of Washington and Colorado have nullified federal law by legalizing marijuana for recreational use in their states. There are 17 states with some form of medical marijuana. These are direct nullifications. While you may not like Obamacare nullification efforts, the people of the states have the right to reject bad laws, and can be shown to have used nullification to protect freedom and human rights. Courts have repeatedly rejected nullification, so there is no "right" for states to reject bad laws. Federal law trumps state law under the Constitution's Supremacy Clause, and Article III of the Constitution declares that federal courts have the final say on the constitutionality of federal laws. The pot laws and amendments are NOT direct nullification. Marijuana is now legal under some state's laws but is still illegal under federal law -- which is why you still see the feds cracking down on some dispensaries in states like California. Unless I am mistaken, the states did not pass anything declaring that the federal laws are null and void, or prohibiting federal agents from enforcing federal law in those states. The Freedom of Choice in Health Care Act, in contrast, is designed to contradict federal law, and to provide states standing to pursue litigation against federal law. And Tea Party groups are asking governors to explicitly reject the federal health law. Yes, Northern states did try using nullification to reject the Fugitive Slave Acts (and courts rejected those efforts -- see Prigg v Pennsylvania) but nullification is most closely associated with Southern states' efforts to preserve slavery. Its chief proponent was South Carolinian John C Calhoun, who led the effort to "nullify" federal tariff laws, causing the "Nullification Crisis" where President Andrew Jackson received authorization to send the military into the state before both sides negotiated a settlement. Neither side was under any illusion that the real battle was over the future of slavery, which is why the Nullification Crisis is regarded as an important event in the runup to South Carolina's secession and the Civil War. And you have conveniently omitted the most recent attempt to nullify federal law -- the effort by Southern states in the 1950s to resist desegregation and the Brown v Board of Education decision. The U.S. Supreme Court rejected Arkansas' effort to resist desegregation in the 1958 case Cooper v Aaron, and with it explicitly rejected the notion that states can nullify federal law. In any case, I have added a line acknowledging that Northern states also used nullification to try and fight the Fugitive Slave Acts.